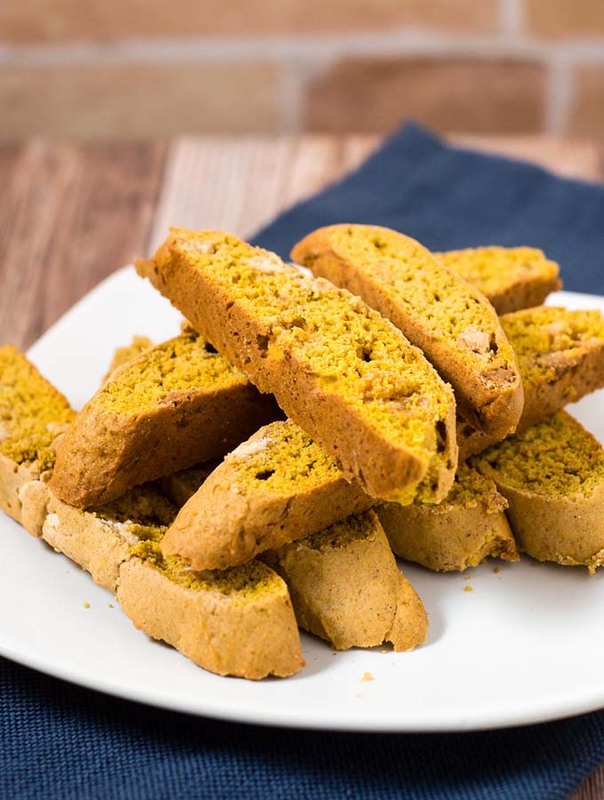 Pumpkin biscotti is a little more tender than traditional Italian biscotti. Pair with a warm cup of coffee for brunch or a light snack. 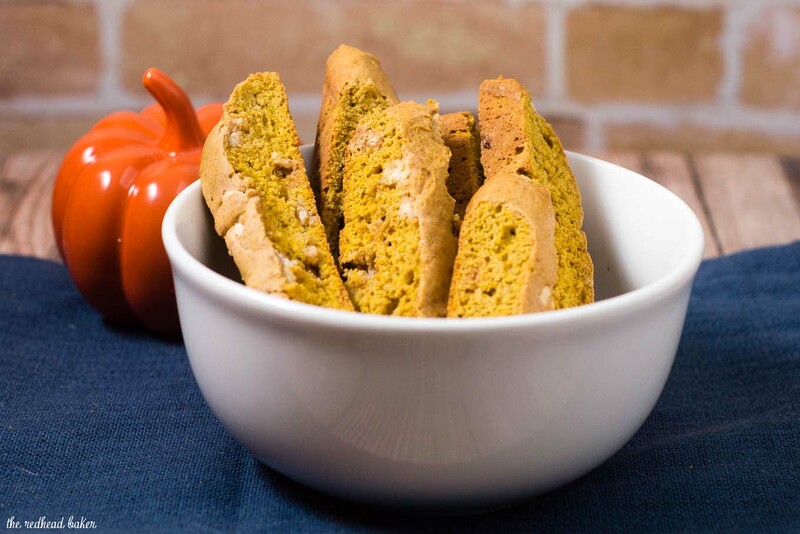 Today’s post is one of my favorite cookies: white chocolate pumpkin biscotti. 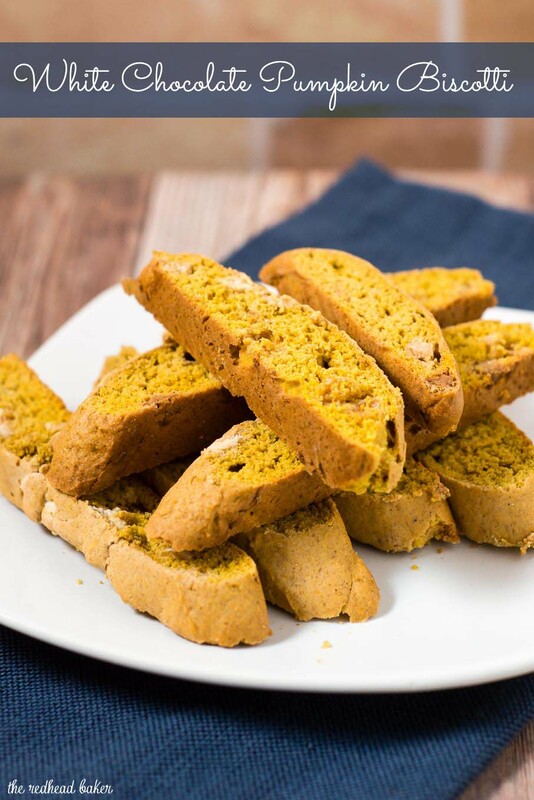 These are a bit more tender than traditional Italian biscotti, as well as slightly more moist. Unlike most American cookies, however, they are not overly sweet. Biscotti means “baked twice,” so these do take a bit more time than regular drop cookies. Be sure to bake these all the way through on the first bake (and the best way to ensure they do is to use an oven thermometer to guarantee your temperature is correct). If you slice the logs with still-raw dough in the middle, your slices will collapse. Even with a fully-baked log, you’ll still need to take care when slicing the logs and transferring the slices. I used a spatula to transfer three slices at a time back to the baking sheet. The pumpkin makes these extra-tender when warm, and they are prone to breaking if not fully supported. As I said, they are slightly more moist than traditional Italian biscotti. 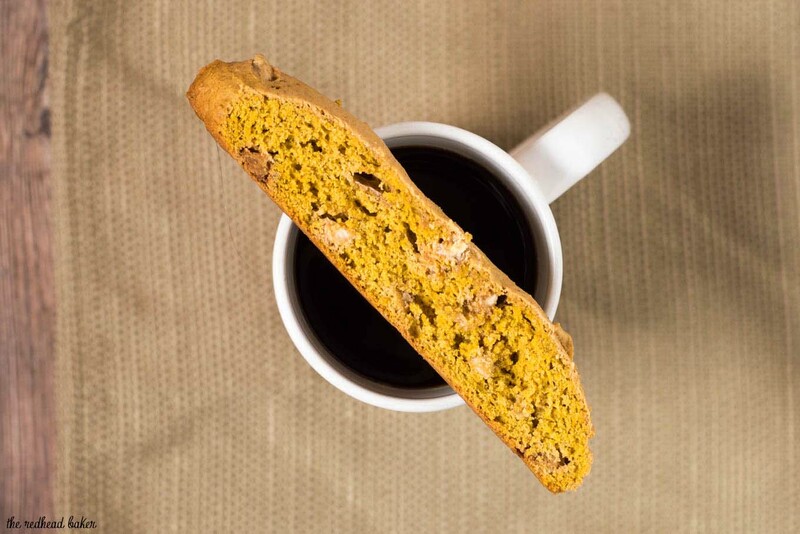 They are still delicious when dunked in coffee, but they don’t NEED to be dunked the way Italian biscotti does. These would also make a delicious hostess gift. Stored in airtight container in a cool, dry place, they will last for up to 4 weeks, but I guarantee these cookies will be eaten far more quickly than that! Preheat the oven to 350°F. Line a baking sheet with parchment. Set aside. In a medium-sized bowl, cream together the softened butter, sugar, spices, baking powder, and salt until the mixture is smooth and creamy. Beat in the egg and pumpkin purée. On low speed, add the flour, stirring until smooth; the dough will be sticky. Stir in the white chocolate chips. Scoop half of the dough onto one long side of the prepared baking sheet, and scoop the other half of the dough onto the other long side. Shape each half into a 10" x 2 1/2" log. Pat the logs into long rectangles, and smooth their tops and sides with a wet spatula or wet bowl scraper. Bake the dough for 25 minutes. Remove it from the oven. Reduce the oven temperature to 325°F. Wait 5 to 10 minutes, then use a sharp chef's knife or serrated knife to cut the log crosswise into 1/2" to 3/4" slices. Or cut the biscotti on the diagonal, for fewer, longer biscotti. 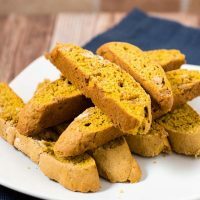 As you're slicing, be sure to cut straight up and down, perpendicular to the pan; if you cut unevenly, biscotti may be thicker at the top than the bottom, and they'll topple over during their second bake. Set the biscotti upright (so the cut sides are perpendicular to the baking sheet) on the prepared baking sheet. Return the biscotti to the oven, and bake them for 40 to 45 minutes, until they're starting to turn golden brown around the edges. They'll still feel quite soft in the middle. Turn off the oven, crack the door open a couple of inches, and let the biscotti cool right in the oven. Remove the biscotti from the oven when they're completely cool. Optional: melt the white chocolate over a double boiler or in the microwave. Drizzle over the cooled biscotti, or dip the biscotti in the melted chocolate. Store airtight at room temperature for several days; freeze, well-wrapped, for longer storage. 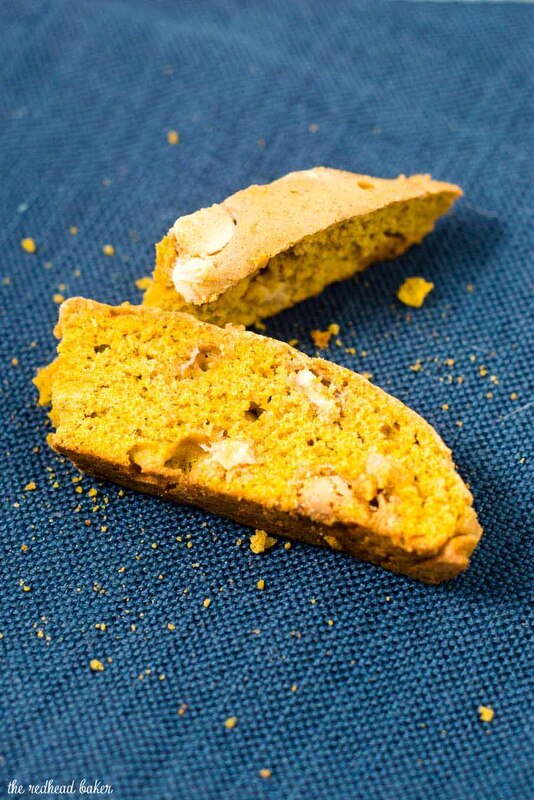 I haven’t made biscotti in so long….you gave me the bug, now I need to make this. These are calling my name! Wish I had one now!